A Boone County commissioner, Boone County council member and several other municipal leaders gathered March 5 at the Boone County Fairgrounds for the second State of the Community panel discussion. Panel members covered important Boone County topics. 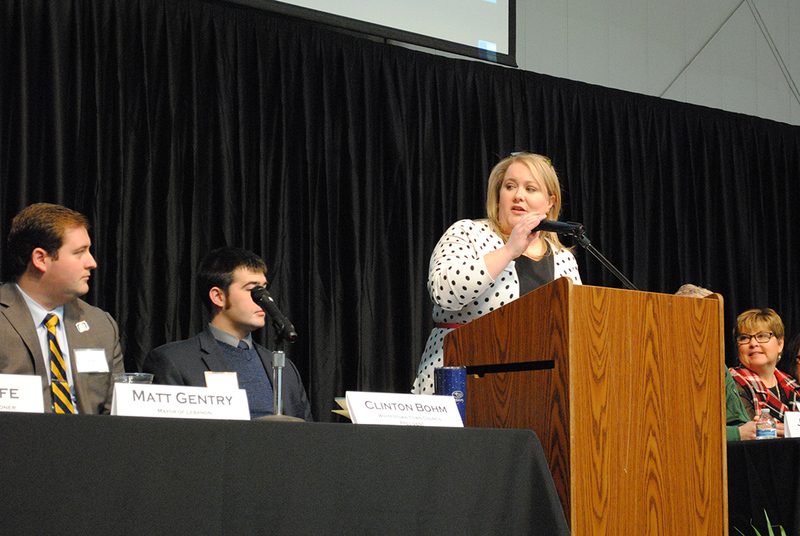 The panel was moderated by Boone County Economic Development Corp. Executive Director Molly Whitehead. Topics included public transportation, infrastructure improvement and growing the employable population, among other items. With regard to mass transit and how it would benefit Boone County, panel speakers agreed on the need for more details. Garrett said because of the way the county is spread out, a mass transit system where workers would have to travel to a bus stop, park their car and then board a bus doesn’t seem practical. Whitestown Town Council President Clinton Bohm said the Town of Whitestown was sampling what mass transit may look like with the implementation of the Whitestown Connector with the Central Indiana Regional Transportation Authority. The Whitestown Connector works to connect Central Indiana employees to Whitestown jobs. The Whitestown Connector travels through the Allpoints at Anson industrial park as well as industrial parks along Indianapolis Road in Whitestown. Bohm said the town is using the Whitestown Connector to gauge the whether mass transit is is a sustainable option. Garrett said he a two-pronged approach is required to grow the employable population in Zionsville and Boone County. Garrett credited zWORKS with accomplishing that objective. Most of the panel cited hidden infrastructure, such as water main pipes, as the major areas of concern. Gentry said the City of Lebanon, for the first time, created a five-year capital plan for water infrastructure within the city. Boone County leaders touched on how they are paving certain gravel roads within the county. Boone County Commissioner Jeff Wolfe said the county drafted a memorandum of understanding with the Town of Zionsville to address growth as the town reorganizes. Wolfe said in 2018, the county paved 3 miles of gravel roads and plans to pave an additional 5 1/2 miles this year. One topic Boone County leaders discussed at the March 5 State of the Community was a possible expansion of the Boone County Jail. Boone County Commissioner Jeff Wolfe said the county has worked closely with Boone County Sheriff Mike Nielsen to determine the best option: A physical expansion of the jail, a treatment program expansion or something else. Wolfe said jail planning will become more of a focus within the next two or three years. He also said 80 percent of inmates are incarcerated on drug-related charges.